Put these little robots to work. Zombies may be huge right now, but they're often forced to share the stage with their equally popular metal brethren, robots. Sminis capitalizes on the craze with a gaggle of tiny, adorable robots with a mind of their own. After a particularly nasty accident in an industrial lab, the Sminis, the creation of yet another mad scientist, are on the loose. It's up to you to ensure they escape the lab and reach freedom, all the while keeping them from the clutches of moving platforms, saws, and other dangerous machines. It's a fresh take on the puzzler genre that makes good use of Unreal Engine 3, but serves up some erratic difficulty issues that mar the experience as a whole. Sminis are sentient creatures that will act on their own unless given a specific order to stop and go. 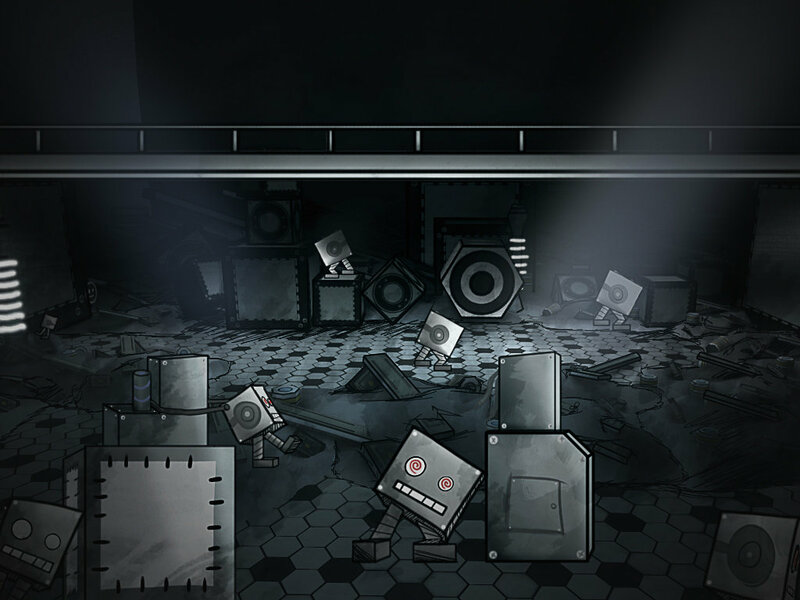 The player acts as the conduit between robot and goal, coaching the tiny 'bots through traps and various other pitfalls via quick taps on the screen. Think Lemmings, but with a cyberpunk twist. These little guys' lives are in your hands. But don't feel too bad should you lose one to the errant hydraulic press -- more will continue to spawn as you guide your gaggle of electronic soldiers to their goal. That's not to say you should rely on a constant supply, though -- each level has a specific amount of Sminis you're allowed to lose until the mission is over. Let too many wander astray and it's game over. Each Smini has a timer that interacts with the others' -- for instance, if you decide to stop one Smini, another could start up. Aside from keeping your tiny underlings in step, you must properly manage spatial issues (Sminis cannot touch or you'll be penalized by losing both of them) and other similar puzzle elements, making this game feel distinctly different from other titles in the genre. This multi-layered approach adds a great deal of challenge to some of the 30 levels, which feel much more like the game's holding your hand than cutting you loose to experiment. When you're up against pumping pistons and enormous robot bosses that'll giddily smack your Sminis away without the slightest thought, it's an enjoyable battle of wits to emerge victorious. Unfortunately, some levels take a turn for the more austere; feeling as though the developers deliberately wished for players to smack into a brick wall headfirst, running high off their successes in the previous area only to reach an indomitable wall of difficulty that feels insurmountable. Once you're faced against sets of moving platforms sliding about to a rhythm you can't discern while being forced to prevent your squad of Sminis from marching off a ledge, what seemed like innocuous puzzle elements before quickly morph into something much more sinister and overwhelming, prompting players to drop out until they feel confident enough to thwart the next, tougher level. Sminis' cutesy robotics and inviting tunes offset what could certainly be taken as rather scattershot complexities as far as each level goes, but feels quite natural and inventive when enjoyed in quick hits. It can be off-putting to be matched up with noticeably more enigmatic missions, but as a whole this ambitious puzzler is an interesting foray into simple touch-based puzzling. It's best approached with caution, though, especially if you're one to shy away from problem-solving that randomly ramps up the difficulty.